VW Personal Trainer is a boldly stylish, graceful, resourceful and feature-full fitness WordPress theme designed and developed for gym, fitness clubs, personal trainers, yoga classes, health consultants, lifestyle coach, physiotherapy centres, fitness studios, nutritionists, massage and spa centres, gymnasium trainers, sports coaches, wrestling academy, boxing club and all businesses related to health and fitness. This multipurpose theme can be customized to be used as a health blog or a trainer portfolio. Its background, color, fonts, logo and various other components can be changed through theme customizer which eliminates the need to hire a professional coder to manage your website. VW Personal Trainer is responsive, retina ready, social media linked and SEO ready. It loads on all browsers and can be translated into several languages including RTL writing style language. It is built on the latest WordPress version and follows standard coding format. 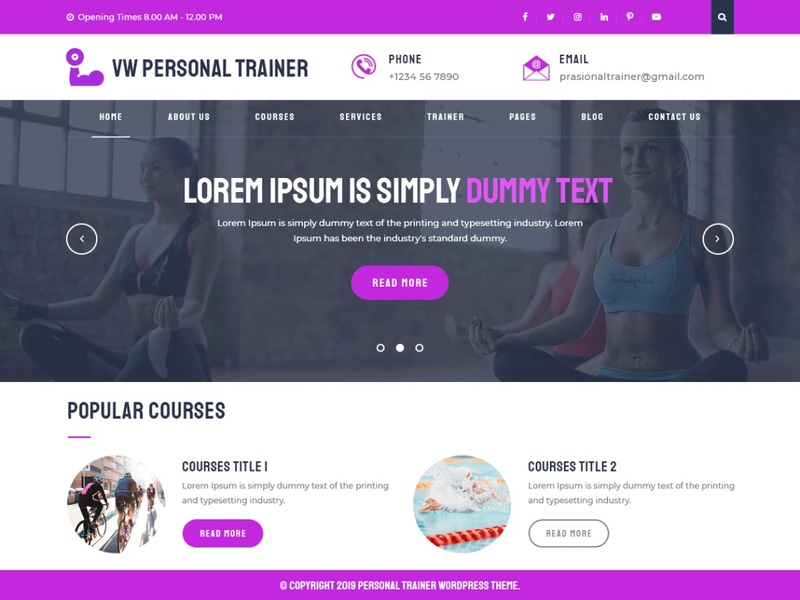 This health and fitness theme is loaded with amazing features and some over-the-top functionality to get a modern website. It offers various layout options, many other header and footer styles, and some beautiful blog layouts. Its design is fresh and alluring to capture attention instantly. It supports various post formats and has many predesigned sections. It comes with online documentation.